Want to enjoy a view of the Strip while having a delicious drink? Or maybe go dancing with your friends to music chosen and mixed by an awesome live DJ? Interested in surroundings featuring LED art or, would you prefer to play games and gamble? Well, look no further: All of those wishes (and more) can be fulfilled at the BOND. You’ll be shaken by the wide array of possibilities. “Bond, James Bond” – a familiar phrase? Except we are not talking about the movie, we are talking about the high-energy BOND cocktail house situated on the Eastside first level of the Cosmopolitan of Las Vegas. 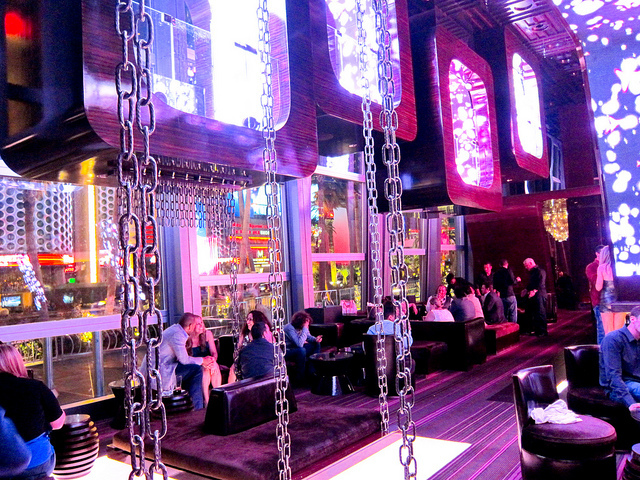 This flashy yet sophisticated club scene is one of Vegas hottest nightlife spots. With its dynamic LED art, live DJ gigs, exotic dancers and upbeat house music tunes the BOND will definitely blow your mind. To bring the cool and extravagant vibe forward this rhythmic night-spot is designed with custom daybeds, lounge chairs and elegant floor-to-ceiling windows presenting guests with some of the finest views over the Las Vegas Strip. The traditional Vegas gamble note is of course not left behind as you can also play video poker or try your luck at one of BOND’s table games. Strike a pose while sipping BOND’s signature Bridget Jones drink, or try one of the many beautifully-crafted cocktails selected by award-winning mixologist Kristen Schaefer. And hey…Don’t forget to get totally BONDish and order your fancy Martini shaken – not stirred. The menu includes a wide selection of drinks which includes 11 different cocktails, 3 types of scotch, 2 types of tequila, 18 types of different brews and 12 types of wine. The trend among the reviews, both good and bad, seems to be the impressive view of the Strip through the floor-to-ceiling windows, and the great atmosphere of the lounge. Overall, BOND has favorable reviews both on TripAdvisor and Yelp, each site’s average rating of the bar bar being very high, so why not give it a try? Las Vegas is a once in a lifetime experience that you don't want to miss. From nightlife and gaming, to dining and car races, we would like to offer you everything you want to know about Sin City in one place. Explore Las Vegas is the most detailed online travel guide, so check us out!